This is the story of a woman who thought she had it all - until she lost her beloved mother to cancer. Trying to process and understand her profound grief, Suzanne embarked on a journey and turned to a deeper practice of yoga. Along the way, she discovers what YOGA IS. 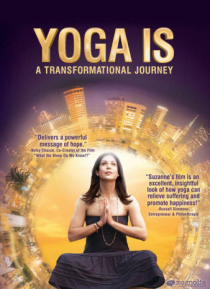 Suzanne's journey led her to India, where she studied various disciplines of yoga and met with respected gurus. During her visit, … she came face-to-face with a near death experience and discovered that something had shifted within her; the light had returned.